Moti Mahal (Estd. 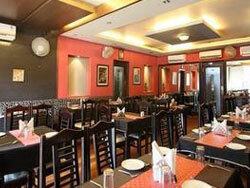 1967) Multi Cuisine Restaurant serves Indian, Continental, Tandoori, Mughlai & Chinese cuisine. It is suited for Teenagers, Families as well as small Private Parties & Business Meets. At an unbeatable tariff never miss an opportunity to dine at Moti Mahal which is known for its authentic food. Food at this place is very good compared to other part of the city. As the restaurant, the kitchen is always very clean. The buffet spreads changes every time for lunch & dinner and even for breakfast. You can expect a variety of menu in every meal you have. Tastefully designed and perfectly maintained, this spacious restaurant at our hotel with attentive staff members, mouthwatering food & refreshing drinks and much more to make your stay most satisfying. The menu is prepared with the finest fresh ingredients and includes a traditional roast carver from our silver serving trolley.